The Drake’s of London flagship store on Mayfair's Clifford Street is a wonderful sight to behold. Fortunately, Chelsea and I got to pay the store a visit on a recent trip to London. Inside, you’ll find armchairs covered in Harris Tweed and cabinetry from the Natural History Museum. Ties in a variety of materials, colors, and patterns are proudly laid out along with pocket squares, knitwear, and tailored jackets. In addition to their own label, Drake’s also carries goods from other brands such as umbrellas from Fox, jackets from Arpentuer, and shoes from Alden. As I was looking through the store’s collection of wool ties for a souvenir to take home, hunger suddenly took a hold of me. I decided the best course of action was to find a place nearby with free wi-fi to consult the internet on where to eat. We left the store and were on our way to a Starbucks when suddenly, Chelsea proposed a better idea. "Why don’t we ask the the Drake’s staff for a recommendation?" So back in the store we went. “Long time no see” said Mick, the rakish man that you may recognize from Drake’s Instagram and Tumblr accounts. We asked Mick if he could recommend a place for us to eat. He asked us what we were in the the mood for and having watched too many episodes of the Great British Bake Off, we asked if he could advise us on where to get a meat pie. “You won’t have to go far at all,” said Mick. Several blocks later, Chelsea and I found ourselves outside The Windmill. We were promptly seated and asked our waiter what his favorite pie was. 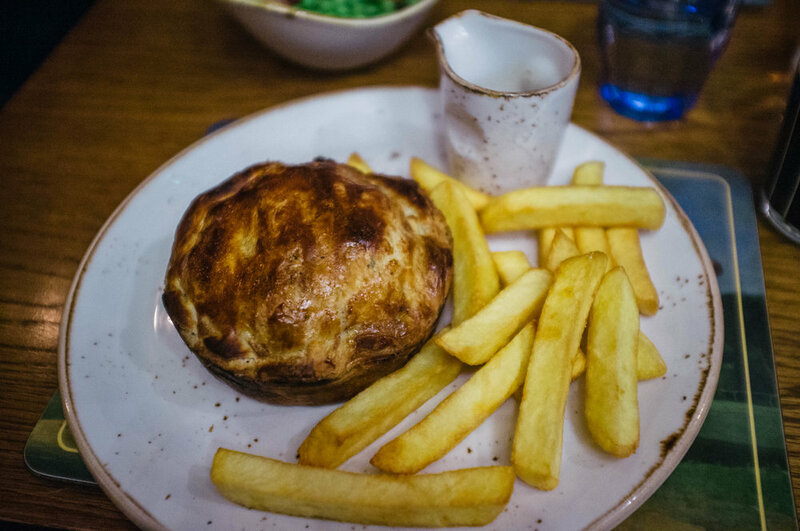 We decided to order the steak and kidney pie with chips, along with a Dorset lamb shank shepherd’s pie with cheddar leek mash and buttered seasonal greens. Both pies were incredible. The shepherd’s pie was savory and comforting while the steak pie was perfectly baked and rich. I attempted my best Mary Berry impression and discovered that the pie made a satisfying scratching noise while scraping it with my fork. It was fortuitous that we ran into Mick. There's a scene in Aziz Ansari's Master of None where Aziz wants tacos. He proceeds to spend 45 minutes researching different options but by the time he arrives at his chosen destination, he discovers they just sold out. Without Mick’s valuable recommendation, I’m sure we would have ended up on a similar wild goose chase. We left The Windmill satisfied. I rushed back to the Drake's shop wanting to thank Mick and buy a tie to take home but unfortunately, the store was already closed. I may not have gotten a tie or pocket square from Drake's on this trip, but I feel that I left the store with something more memorable.